Dining setting gallery. 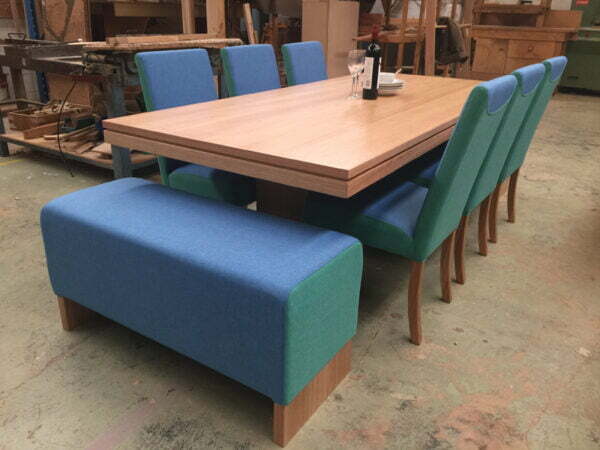 Click the photo below to discover examples of table and chair combinations, different timber and fabric use etc.. Making quality furniture to order, there’s something new to see everyday. Furnishing Adelaide, regional SA and the capitals of Australia. As a working factory/showroom, we handcraft quality modern furniture to order right here which means you can blend design styles, explore timbers, paints, fabrics, dimensions and hardware options and upgrades. The result is quality, timeless timber furniture made just for you, right here in Adelaide. This also means our extensive online showroom is always expanding with new ideas, but it will always only ever show a fraction of what we are able to achieve because we are always advancing our designs and exploring new timbers, fabrics and hardware.